This week at Campaign Mapping, we had the chance to start looking at a few issues with a little more analysis. That is, we dove into a little more depth. 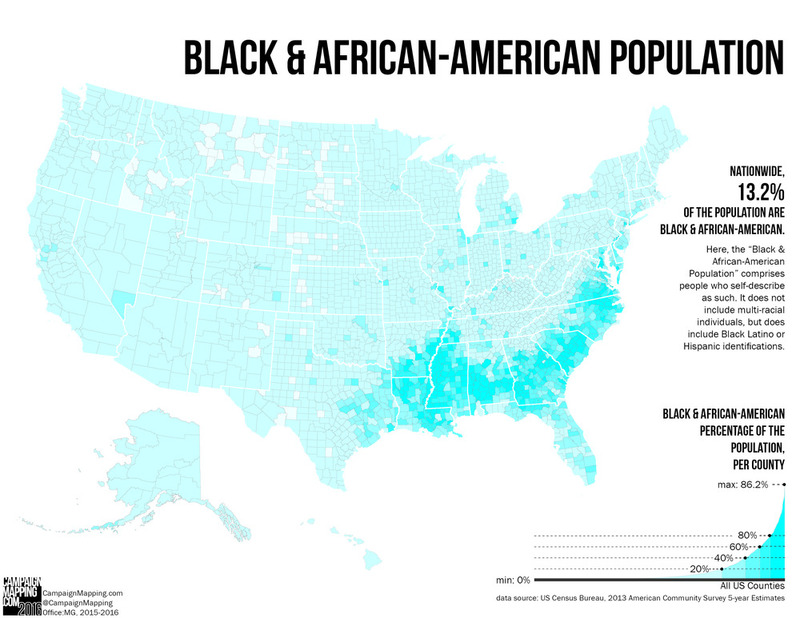 Starting with racial tensions—a topic with still much more to be mapped—we looked at the geographic distribution of minorities in general and African Americans specifically following a comment John Kasich included in his announcement speech. Kasich noted that the American system often works against, rather than for, certain minority groups. Contrast this with the ways in which others have discussed race-based disparities in opportunity, including Ben Carson's comment that the "racial wars" in the US "don't exist." By the end of the week, we considered Mike Huckabee's characterization of "racial strife" as a problem of "sin" rather than "sin" and mapped the regional patterns of overall racial and ethnic diversity (or lack thereof) across the country. We dug a little deeper into two additional topics regarding economic opportunity: education and small business. Marco Rubio's proposal to reform higher education—its structure and its costs—prompted a map of recent graduates' student loan default rates. As for small businesses, we looked at recent decline and growth of small businesses per state following a comment by Carly Fiorina. In the atlas entry, we see the effects of last decade's financial crisis and also interpret what really constitutes a "small business." We considered the question of American partisanship after Ben Carson described the country as "Republicans and Democrats instead of Americans" suggesting that voters follow poor leadership based on party affiliation rather than the quality of ideas and policies. Full disclosure: describing the country as a collection of "red" and "blue" is of particular importance to the Campaign Mapping project, as that map is the one most commonly used to characterize our politics and is also a powerful image influencing how American voters see themselves and their fellow Americans. Next week, we will start by looking at infrastructural needs in the country based on a call for investment (and job creation) by Bernie Sanders. Along that vein we'll also look at energy sector jobs as well as a few other ways in which American households and families have been described by the candidates.